Have you ever thought about getting tinted windows for your vehicle? While you may think of tinted windows as just a luxury for aesthetic reasons, having them will give you long-lasting functional benefits to protect yourself & your vehicle. Today, we’ll go over some of the perks of having them. Prevents Fading: Your car is an investment that you want to preserve for as long as possible. Getting tinted windows is a great way to protect it. Tinted windows blocks UV rays that can fade your interior. It also prevents cracking and warping to keep your car looking newer for longer. Tinted windows will also block windshield glare, protecting your eyes from direct sun and bright headlights. Blocks UV Rays: Tinted windows can block up to 99% of ultraviolet rays which can accelerate skin aging and cause skin cancer. Even lighter tints can block out both damaging UVA and UVB rays. 53% of skin cancers in the U.S. occur on the left side of the body, correlating to the driver’s side of a car. For people who drive regularly, having window tints will provide a great advantage to help prevent these issues. Reduces Heat from the Sun: If you’ve had trouble maintaining the right level of AC for all of your passengers, tinted windows can help! Depending on the grade, they can block anywhere from 35-65% of the solar heat that builds up in a car. You can balance climate and comfort and cut down fuel consumption from excessive AC use. 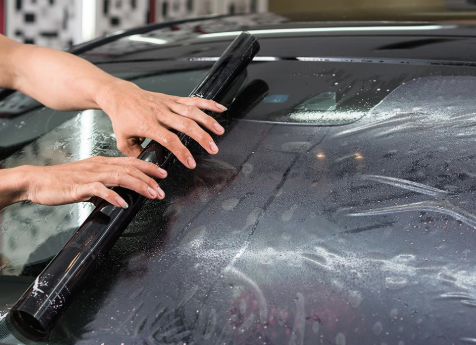 Prevents Glass from Shattering: Tinted windows keep glass from shattering if an object hits it. In the event of a car accident, you’ll be protected from flying glass shards and from being ejected through windows. On top of that, thieves will find it difficult to break through tinted glass and get into your car. Privacy and Security: Films come in a wide range of shading to provide a level of privacy as you go down the road. When you park the car, you can walk away and knowing that your valuables inside cannot be seen.